Samsung’s back at it again with a couple of new smartphones: the Galaxy S7 and Galaxy S7 Edge. Today we’ll be taking a look at the S7 Edge as the sequel to the S6 Edge that we reviewed last year Samsung Galaxy S6 Edge and Gear VR Review and Giveaway Samsung Galaxy S6 Edge and Gear VR Review and Giveaway Samsung sells more Android devices than any other manufacturer, and thanks to some aggressive marketing, the Galaxy brand is almost synonymous with Android. Read More . Not a whole lot has changed physically. The software’s gotten a bit of an overhaul with the upgrade to 6.0 Marshmallow Android 6.0 Marshmallow: What It Is and When You'll Get It Android 6.0 Marshmallow: What It Is and When You'll Get It Android Marshmallow is here -- but why should you care? Read More , but the physical aesthetic has barely changed at all. It’s still a sleek, premium device with uniquely curved edges. But should you consider upgrading? Let’s take a closer look. If you ever saw an S6 Edge, you’ve basically seen an S7 Edge. The devices look nearly identical. You’ve got a home button along the bottom (with a fingerprint sensor built-in, of course) and capacitive Recents and Back keys flanking it. Around the device is a bit of metal with slots cut out for the headphone jack, micro-USB port (not type-C What Is USB Type-C? What Is USB Type-C? Ah, the USB plug. It is as ubiquitous now as it is notorious for never being able to be plugged in right the first time. Read More ), and speaker along the bottom — as well as for the SIM card/microSD card tray at the top. Near the earpiece is an LED notification light, and built into the camera flash on the back is a heartrate sensor. Samsung did ditch the IR blaster this time around, so if you enjoy switching TV channels with your phone, you’ll have to look elsewhere. With Corning Gorilla Glass 4, the S7 Edge should be sturdy enough, but given that even the back panel is made of glass, this is one delicate-feeling device. And that’s not even mentioning how slippery and slick it feels in the hand. The edges of the phone make it a bit awkward to hold without your palm tapping the curved edges by accident, so I found myself having to hold it looser to be able to use it properly. That’s a recipe for a shattered screen not too far down the road unless you’re willing to hide it away inside a thick case. Given that there’s just one little speaker at the bottom of this device, the audio here isn’t going to blow you away, but it’s certainly not weak. I had no problems listening to music or watching YouTube videos with it. By now it’s a staple of flagship smartphones, so of course the fingerprint scanner has made its return on the home button of the S7 Edge. As you might expect, you can program several fingerprints and then use any of those fingers to unlock your device, log-in to your Samsung account, or sign-in to some websites using the pre-loaded browser. The process is extremely quick, simple, and accurate. I’m usually pretty unenthused by smartphone cameras. Most have essentially the same quality and do the same things. But I found myself really enjoying the S7 Edge’s cameras. Both have a really fast f/1.7 aperture which means great low-light shooting and blurry backgrounds. The front-facing camera is more wide-angle than most, meaning it’s easier to get your face, your friends’ faces, and your surroundings into any selfie. Samsung’s camera app is also simple and yet powerful. You can switch into Pro mode to adjust the shutter speed, ISO, manual focus, and more options; or you could switch to Selective Focus to switch the focus point of a photo after you’ve taken it. There are even more photo modes you can download from the Galaxy App Store. Above is one shot I took on a sunny day, which is nice, but it doesn’t really show off the low-light capabilities. This shot was taken in a poorly-lit room underneath a desk. It was pretty dim there. And yet, you wouldn’t be able to tell that from the photo – it just excels in low-light. You can also launch the camera app instantly by pressing the home button twice for super quick access. On the whole, the camera is just a fantastic experience. Samsung is known for heavily modifying their version of Android Android Skins Explained: How Do Hardware Makers Change Stock Android? Android Skins Explained: How Do Hardware Makers Change Stock Android? Hardware makers like to take Android and morph it into something that is entirely their own, but is this a good or a bad thing? Take a look and compare these different Android skins. Read More . That’s definitely earned them a mixed reputation in the Android community, but I actually quite like this iteration of TouchWiz. You can see some of the visual differences above with the notification shade and settings app, but there are a lot of other differences as well. When you find yourself on the homescreen, you’ll see that the launcher has a built-in news app off to the left side of screen that’s always just a swipe away. Swiping to it is a little jerky and not as fluid as swiping everywhere else on the phone. The news app is called Upday, but it can be turned off in the settings if you don’t like it (or you could always switch to another launcher What Is the Best Free Android Launcher? What Is the Best Free Android Launcher? Nova launcher, Apex launcher, and dodol launcher are all solid free launchers, but which is the best? We put them to the test. Read More ). You’ll also notice that Samsung’s icons have a rounded, colorful look to them, and they have built-in notification tickers. These are apps for the edge part of your Galaxy S7 Edge. Swiping in from the side of your screen allows you to access a selection of tools, and it’s highly customizable this time around. You can choose which side of the screen to swipe from, what part of the screen, and how transparent the indicator for that swiping area is. You can then have several pages of tools accessible by swiping there. These range from quick access apps to a compass, and there are even more available online. The edge is also usable when the phone is off. You can swipe along it to see if you have any notifications, and just the edge will turn on. You can also set the phone face down, and if you receive a call or text from one of your chosen contacts, the edge of the phone will light up with their designated color. Overall, this is the feature you’re supposed to be paying extra for, and unless you find one of these edge apps to be life-changing, it just really doesn’t seem that useful to me. Probably one of the biggest advantages to Samsung’s TouchWiz is the ability to have two apps running side-by-side at the same time — or to even have more apps than that running overtop of each other. Let’s start with multi-window. This feature allows you to have one app occupy the top of the screen and the other on the bottom. You can access it by pressing the Recents key and tapping the two-line icon for any app, or you can open the app you want and then hold the Recents key. A little dot will appear between them so you can adjust how big each section is, and a blue outline will let you know which app you’re currently using. Now, if you’d prefer to have an app open as a floating window, you can pull your app down from the top left corner. The dot then allows you to drag it around the screen or even minimize it down into a little floating icon (shown above with the Phone and Messaging apps). This is an awesome little feature, but I can’t imagine it’s something that you’d be using all the time given the (relatively) small 5.5″ screen; on the enormous Galaxy View Samsung Galaxy View Review Samsung Galaxy View Review If an 18.4-inch tablet sounds enormous, that's because it is. The Samsung Galaxy View has a larger screen than most laptops, and yet, it's an Android tablet. Read More , it makes more sense. Much like CyanogenMod More Of The Best Free CyanogenMod Themes More Of The Best Free CyanogenMod Themes Looking for a quick, easy, and free way to customize your Android device? Check out these themes! Read More , Samsung’s software has a built-in theme engine and store, meaning you have nearly limitless ability to customize the look of your device. It can change everything from the notification shade to the icons on your homescreen to the phone app. There are plenty of nice free options and some even cooler ones that’ll cost you a couple of dollars. There are too many features in here to talk about them all in-depth. There’s a gaming feature that gives you a floating in-game button for pausing and taking screenshots; there’s a one-handed operation feature for shrinking the screen down to a more reasonable size; there are advanced screenshot options like scrolling down to capture seamless long screenshots; and there are options for muting your phone by turning it over and vibrating when you pick it up to alert you to notifications. Alright, take a deep breath, because we’re still going. There’s also a Galaxy Labs feature for more experimental functions, which right now has an iOS-like “show all apps on homescreen” option, and the ability to call a contact by holding the Home button and saying their name. Venture elsewhere in the settings menu and you’ll find even more ways to customize your device. You can set which apps are allowed to show notifications, and you can see exactly which apps are using which permissions (and of course you can toggle all of these). The S7 Edge also has a huge number of accessibility options Accessibility on Android: Make Your Device Easier to Use Accessibility on Android: Make Your Device Easier to Use Android includes features to make sure that everyone can enjoy their phone. Even if you aren't disabled, the Accessibility menu holds some neat tricks to look into. Read More . You can disable areas of the screen, unlock it with a series of swipes or without touching it at all (using the proximity sensor), you can have it read everything aloud to you, and much more. One last thing that needs to be mentioned is the Always-On Display. This feature means no more constantly checking your phone every two seconds. Thanks to the AMOLED screen, it can turn on just a few pixels at a time, allowing it to use very little battery as it displays the time, date, and any notifications you have. Most of the screen just stays black. I personally found the Always-On Display to be distracting and eventually turned it off, but I could see how that would be useful — and it didn’t appear to have a noticeable effect on my battery life. 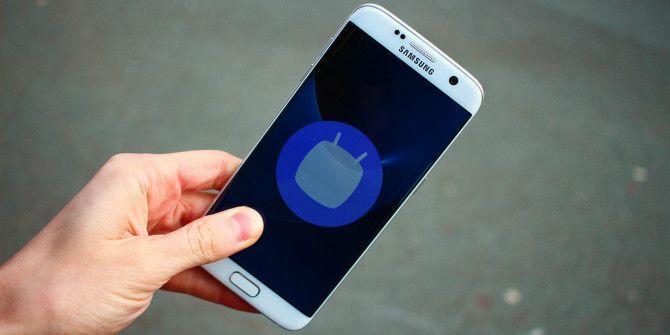 Samsung’s managed to trim back their amount of pre-loaded software (or bloatware How to Remove Bloatware on Android Without Rooting How to Remove Bloatware on Android Without Rooting Did your phone come with a bunch of crappy apps pre-installed? Let us show you how to get rid of them the easy way. Read More as we sometimes lovingly refer to it). You get a few signature Samsung apps here like S Voice, S Planner, and S Health, as well some Microsoft apps like Word and OneDrive. S Health is probably the neatest of these since it makes use of the heartrate sensor that’s built-in to the camera flash. I’m not sure who that’s useful for, but it’s certainly unique. And if you want anymore Samsung apps, you’ve got the Galaxy Apps Store at your disposal. S Voice, if you were wondering, has taken a backseat to Google Now. Holding the Home button will activate Google Now on Tap, one of Marshmallow’s biggest features that allows Google to scan your screen and suggest things to search for. You can still activate S Voice by setting a wake-up phrase, but there’s no compelling reason to use it over Google Now. With a 3,600mAh battery, the S7 Edge smashes battery life out of the sky. Samsung devices have tended in the past to be on the “almost good enough” level, but this one lasted me a day and a half with 7 hours of screen on time. Other times it lasted multiple days. Not bad at all. Should You Buy The Galaxy S7 Edge? There’s a lot of proprietary Samsung-only stuff here, so this is going to come down to personal preference. If you like multi-window, or the way TouchWiz looks, or some of those pre-loaded apps, or maybe the screenshot features — then go for it! However, I’d probably recommend the regular S7 over the S7 Edge in most cases. The curve of the device not only makes it awkward to hold due with accidental palm presses on the edges, but it ups the price a whole $100. Unless you see yourself really making use of those edge tools, you can probably do without. I own this mobile for the last 4 months.. I won, thank you for the great giveaway! 13 (if I remember correctly) entries over 89416 .... means 1 chance over 6878, it means 0,01454% to be the lucky one as I was! Great! Please announce name here of winner ? Pleae announce the giveaway winner. if you received an email saying that you won and asking for your info, you won. if not, sorry. i don't yet know, but if you received an email saying that you won and asking for your info, you won. if not, sorry. hopefully one that happy day arrives message, thank you very much! not yet. but if you received an email saying that you won and asking for your info, you won. if not, sorry. yeah it's very similar but i liked it too :) good luck! Two hours left! I wish everyone good luck and a big congratulations to whatever winner is chosen. I'm looking to ditch my apple and move to Samsung. Fingers crossed. I will love to have this phone. If is Real giveaway. they do tend to make some nice stuff. good luck! good luck then dude ! How do we do this? We make a comment and that is our entry? I have been thinking about getting a cell phone but I'm really not sure they are going to catch on. 4 days left and no extra entries via that referral link...means no friend followed that link...all i can do is to wait till i win and shut their mouth down. I'm still using a LG flip phone. How sad is that? You have to wait until one letter is done to enter another when texting! Got this for the VR. It is the best feature of this phone!! Been using Gear VR since S6. Upgraded to this because of the extra power and liquid cooling. Quit wasting time with Google cardboard. This is on a whole other level. true, i tested the Gear VR back for the S6 and it was pretty cool -- didn't get it for the S7 this time around but i'm sure it's only gotten better. You guys must be rich or just buy it from someone idk. huh? i mean we're a tech website. reviewing tablets, smartphones, etc. is kinda our thing. this looks awesome, god I hope I could win. You definitely made the case for the regular S7. The S7 edge isn't suited for most Baby Boomer. I'm quite impressed with the specs of the S7 edge. Does the camera have a feature like the iphone 6s's short video trap of a picture? nah i don't think there's something like Live Photos built in, but some android apps have cropped up to emulate that feature, and the camera has a bunch of other features like creating animated GIFs and whatnot. Yay, I luv the long battery life. Extreme - specs and price! Wow - That's a lot of reading material! The S7 edge might be above me, but the S7 seems just my speed! I love the camera and the battery life. shyea the price is killer, good luck with the giveaway! Thanks, Justin. I think I'll need it, lol. yeah the camera is really quick and awesome in dim light. gotta love that. Its a stunnung mobile, really want to get it. GOOD LUCK TO ALL OF YOU. EXACTLY what I am manifesting! Hope to get the one. Would love this .. I have a Samsung .. it's an oldie .. I've had it10 years ..
That camera does look good. Samsung's stock rom is better than Google's. Hope to get the one. I've been tempted to get this phone especially since my S3 Mini bought it with the upgrade to Android 4.4. Thanks for this review. It just makes it more difficult deciding to drop $800. I upgraded from a Galaxy S4 a week ago. 2 comments so far if you elect to set a password and use the fingerprint option as I did DO NOT forget your password because when you turn off your phone before an air flight when you turn it back on you have to enter your password because the fingerprint option is disabled. I had to have my phone wiped and reloaded from my old phone because I forgot my password. I love the edge function because emails and messages have a larger display area. yeah it's definitely pretty dang good! No code after watching the video!! This phone would make my life so much easier since I am disabled and have difficulty with fine motor skills. it does have some really really solid accessibility options, hope you get it! Awww, this sure is a hell of a phone ! Sign me in! Would be a nice upgrade from my LG G3! OH man now that would be the phone to have!!!! well then good luck and may the odds be ever in your favor! Would absolutely love to win this ..
Good luck to everyone! I hope I could get this one. hope you do too, good luck! Awesome phone would love to win this phone. yeah it's pretty great :D good luck! This might be a good upgrade from my Samsung Convoy 3.
haha i thiiiink so ;) good luck! One important feature worth mentioning is the return of expandable microSD storage in the S7 with support for upto 200GB of additional memory! This would be a fantastic upgrade from my HTC DNA. Using an old HTC DNA right now. This would be an amazing upgrade. oohhh quite an old ish device. good luck! yep, good luck to you! Technology at it's best. Count me in.